Jigokudani, home of the world-famous "snow monkeys", is situated in the valley of the Yokoyu River, downstream from Shiga Kogen and just upriver from Yudanaka and Shibu Onsen. Over 160 Japanese Macaque monkeys inhabit the area and despite the harsh conditions (snow-covered for one-third of the year) and the rough cliffs and hot springs bursting from the ground (hence the name, Jigokudani means “Hell’s Valley”), the area is paradise for the monkeys. The reason is that same hot spring water collects in pools that the monkeys enjoy bathing in. 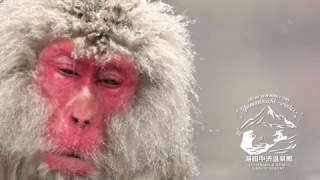 This provides an opportunity for us humans to watch the Macaque up close and observe their fascinating behavior (not to mention enjoy the blissful looks on their faces as they soak in their onsen). Just before the entrance to the park is the Jigokudani Steam Vent, a nationally registered natural object and an impressive example of natural onsen forces at work. Across the Yokoyu River is Korakukan Ryokan where humans also can enjoy an onsen bath.